The Shiretoko Peninsula has been a UNESCO World Heritage site since 2005. Nature lovers and travellers in search of wild landscapes will find their hearts desire in Hokkaido. Whatever the season you choose to travel to Hokkaido, you can be sure that nature will be clothed in her finest attire to welcome you. Many travellers consider winter the best time to visit this northern island. It’s true that the snow covered landscapes, like the frozen Sea of Okhotsk, are really quite beautiful. And in this part of Japan, in places like Asahikawa, winter sports enthusiasts can find vast areas where they can ski which are on a par with most large European ski resorts. They also have other activities on offer such as hot springs and a varied cuisine, which, at the very least, can transform your visit into an original experience. Club Med has just opened a second hotel complex in Tomamu, in the centre of the island, which will delight ski addicts. Winter is also the time when you can join in the Festival of Snow (yuki matsuri) in Sapporo, which has taken place at the beginning of February every year since 1952, and where ice sculptors create impressive but ephemeral works of art. Those — and there are some — who appreciate neither snow nor the sometimes very low temperatures, need do no more than come back in the spring, summer or autumn when this part of Japan is even more attractive in as much as nature still dominates the area and remains relatively undisturbed by human activity. It was not developed until the 19th century, and most of the activity was concentrated in the western part, allowing the rest of Hokkaido to preserve its “wild” side, a side that is eagerly sought out by numerous tourists today. However, they don’t always think of visiting the archipelago’s second island. Eastern Hokkaido, or Doto to those who know it well, is also worth a visit. A few roads and a single railway line — the JR Senmo Line — are all it takes to get you there for the start of an emotionally charged adventure. Abashiri, notorious for being the location of the harshest prison in the archipelago, now open to the public (see Zoom Japan no.48, February 2017), is a good starting point. Trains on the Senmo Line leave from this port city in the direction of Kushiro. After running for several kilometres alongside the Sea of Okhotsk, which, according to the season and the time you are passing by, can display different characteristics from anger to an almost unnerving calm, it’s time to get out at Shiretoko Shari station, point of entry to the Shiretoko Peninsula, which was listed as a UNESCO World Heritage site in 2005. A forty-minute taxi or bus ride will get you to Utoro. This little port is an essential stopping place. It’s here you’ll find the main hotels on the peninsula such as the Shiretoko Grand Hotel Kita Kobushi (www.shiretoko. co.jp/en/) for travellers looking for great comfort, or Shucho no ie (www.bighokkaido. com/shuuchoo-no-ie), a guest house run by Mrs Umezawa who charmingly but vigorously defends her Ainu origins. Most establishments have a hot spring to liven up your visit, especially after a long walk through the forest looking for striking landscapes or animals you are unlikely to meet where you live. Ten minutes from the port, you will find the information centre for Shiretoko National Park (08.00-17.30 from April 20th to October 20th, and 09.00- 16.00 from October 21st to April 19th) where it’s advisable to pay a visit before starting out on your adventure down one of the surrounding paths. Besides the exhibition space, a place to eat and somewhere to rest, there are maps and a few other useful accessories such as binoculars (500 yen per day) or anti-bear spray (1,000 yen per day). It’s unusual to come across one along the paths, but you never know! If you want to see bears, it’s better to take a boat trip. There are two every day: at 08.30 and 15.30 (5,000 yen) from Utoro Port (www.kamuiwakka.jp), crossings take around two hours and let you observe brown bears in complete safety when they come to catch fish close to the sea. It’s a fascinating spectacle, especially as it takes place in incredible surroundings with waterfalls and impressive cliffs. In the evening, guided outings are organised for those interested in nocturnal fauna such as foxes, stags and does, but also so that you can lift your eyes to the star-filled sky, as we so rarely have the opportunity to delight in all its beauty in our light polluted country. 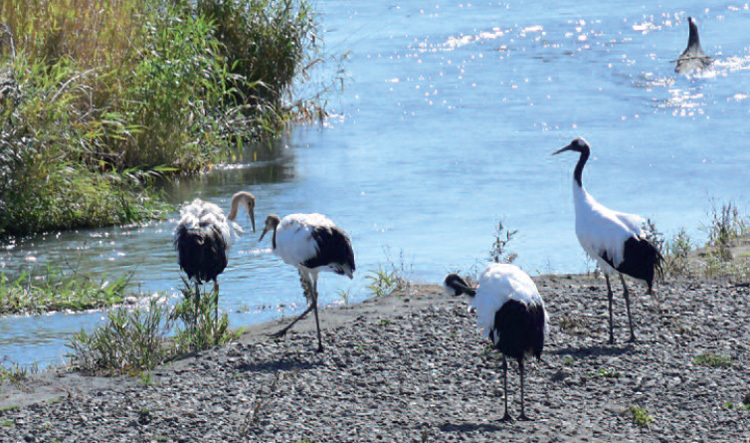 A family of cranes at the riverside close to Lake Mashu. 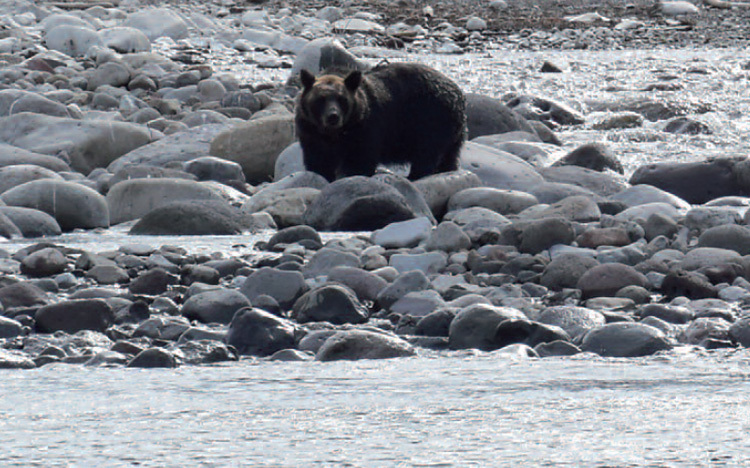 It’s easy to observe the numerous brown bears living on the Shiretoko Peninsula. 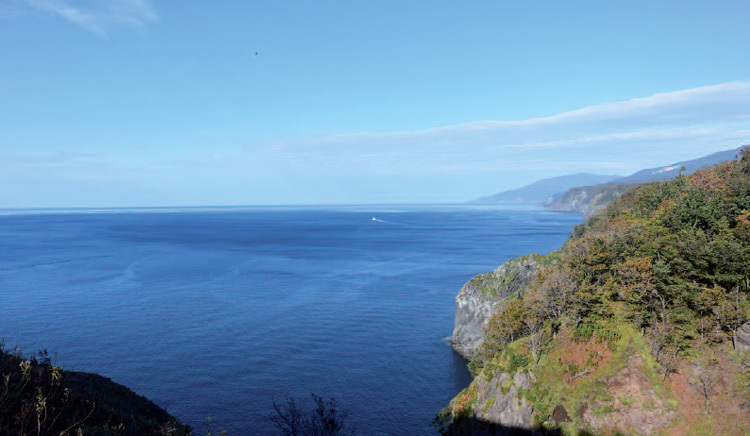 If these first encounters with nature in Shiretoko do not satisfy you, it’s time to go to Rausu on the other side of the peninsular, where more trips take place, this time, in order to see whales. The Shiretoko Nature Cruise company has two trips per day (09.00 and 13.00, 8,000 yen, www.e-shiretoko.com) lasting around two and a half hours, during which it’s unusual not to see orca and whales. A little further south, a walk on the peninsula that’s only accessible by boat, is an experience that holds quite a few surprises, in particular, when large numbers of seals decide to poke their noses out of the water. On leaving the waterside to walk inland, Doto has more to astonish us. Again, there are animals everywhere. It’s not unusual to see cranes when looking out of the train or bus window, whichever kind of transport you have chosen. In winter, the mating season for these magisterial wading birds, it’s often a magnificent sight. Kayanuma station, on the Senmo Line, is one of the best places to observe them, as is Tsurumidai, a wonderful spot to see around two hundred cranes, which winter here. You can get there by bus from Kushiro (55 minutes). The rest of the year, with any luck, they’ll appear when you are least expecting them. The mountains, lakes and volcanos can also have an emotional impact on visitors. Having escaped the mass tourism prevalent in the rest of archipelago, all these places have retained their original beauty. At every stage of your journey, you will fall irredeemably under the charm of nature, which is sometimes wild and desolate like Mount Io, known to the Ainu as “the naked mountain”. It is quite bare, in complete contrast to the lush surroundings of other mountain peaks in the region such as Mount Akan or Mount Kamui. Mount Io, whose deposits of acid smelling sulphur have been exploited for a long time, is also an attraction due to its sometimes very impressive volcanic activity. 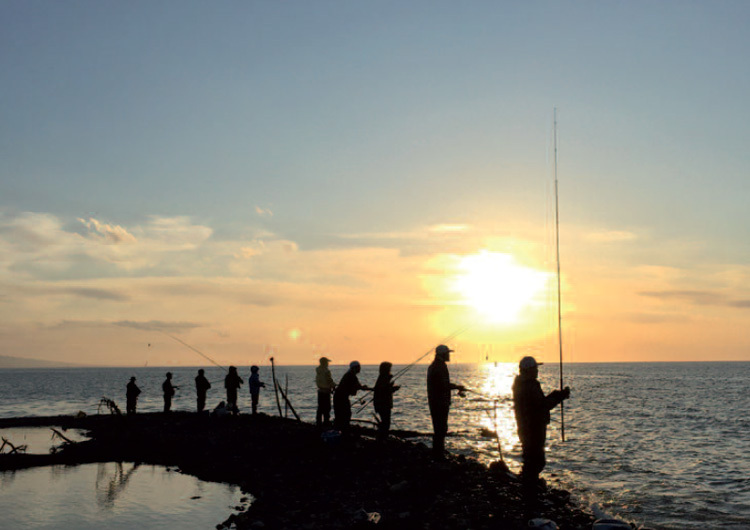 At sunset, on the Sea of Okhotsk, salmon fishers are at work. The presence of volcanos means there are hot water springs nearby. The most famous in the region is Kawayu Onsen, where there is a railway station on the Senmo Line. You can choose to stay over at the Kinkiyu Hotel (http://kinkiyu.com), the largest establishment in this spa, which has recorded a notable decrease in visitors for several years now. This is a great shame as it is situated in the heart of one of the most beautiful landscapes in Japan, as is confirmed in many Japanese guide books. But if you prefer somewhere rather less imposing, or if you want to immerse yourself in Ainu culture, go to Kotan, around twenty minutes by taxi from Kawayu Onsen. There are some buses, but they are infrequent. The best place to stay overnight is the Marukibune (https://marukibune.jimdo.com), where you are advised to have dinner so you can enjoy the musical entertainment, which regularly takes place in the evening. Just behind the hotel is an open air hot bath looking over Lake Kussharo and the surrounding mountains. Whether it is at dawn or at sunset, taking a hot bath here will always be an unforgetable experience. Further south, the vast swampy plain of Kushiro Shitsugen, which you can visit in a canoe, illustrates Doto’s incredible natural diversity. There are numerous opportunities for outings on the Kushiro River where, here too, you need to expect some great surprises, both animal and vegetable. But as soon as you put down your paddle, you will want to start on another journey of discovery in this wonderfully original place called Hokkaido. flights from Haneda. Taxis or buses travel three times a day (09.25, 13.30 and 15.30) to abashiri (910 yen) or utoro (3,300 yen). the okhotsk express train will take you to abashiri. The journey lasts around 5 hours (9,910 yen). an overnight coach service (dep. 23.15, arr. 06.45) ensures the connection with utoro (8,230 yen).